Sparkle and Bling: TSG184 Tag, You're it!!! I love the month of December leading up to Christmas and love being able to get creative. 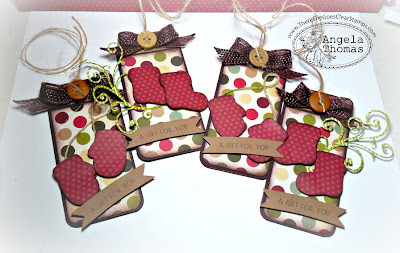 For this week's TSG challenge of making tags, I had a lot of fun. This week our challenge is brought to us by our Trendsetter of the week, Wendy! She has challenged us to make a tag, whether it be on a card or just the tag itself! Here is a shot of the tags I created all together. The shot of the tags using the mittens die and sentiment from the TSG set called "Warmest Wishes". 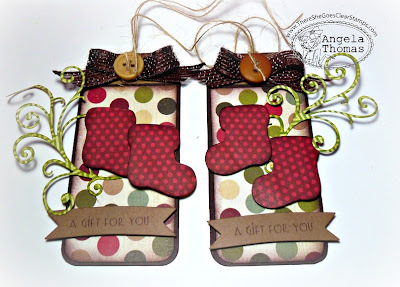 A shot of the tags using Warmest Wishes again with the stocking die. For the set of tags, I've used some tags that I purchased at Michaels which I have altered by adding DP from Simple Stories and Echo Park. I wanted to keep them with a bit more vintage look so I have sponged the edges with Chocolate Chip ink. To be eligible for the giveaway, create a project that either is, or incorporates a tag, and then come back to the TSG Blog to add your name and a link to your project in the InLinkz that is located at the bottom of this challenge post. This challenge is open until the winner has been announced on the following Monday (December 10th). The winner will get a $5 gift certificate to use in the TSG Web store! You do not need to have a blog to be able to participate in the TSG Challenges! You can simply add the URL link from your project after it has been uploaded to your online craft gallery. If you upload your card to an online craft gallery, please use the keyword TSG184 so we can check out your beautiful work! Super cute tags. Love the vintage feel. The mix of polka-dots is great. So cute with the polka dots Angela. Tse are WAYYYY too cute!